In his groundbreaking graphic novel Maus, Art Spiegelman took a giant artistic risk that paid off painfully and beautifully. The work is a remembrance/memoir of Spiegelman’s own family and their experience of the Holocaust. The risk is in the telling: Spiegelman cast it as a version of a funny-animal cartoon. Jews were mice, Nazis were cats. The shock of the metaphor, the way the reader had to grapple with its “taste issues,” and much more, made for an unusually moving and unsettling experience. Spiegelman began Maus in 1980. In the nearly 40 years since, it has proven influential in varied media (Spiegelman himself accused the 1986 animated film “An American Tail” of plagiarizing Maus). 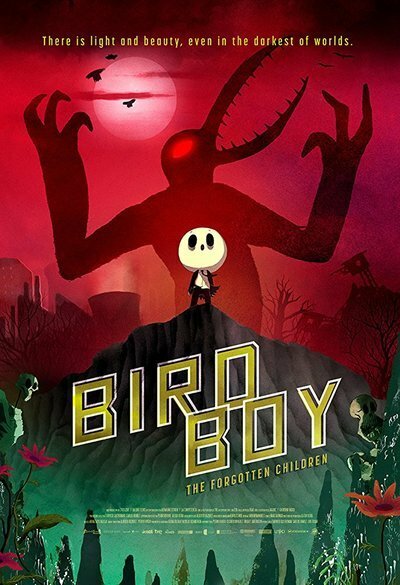 The new Spanish animated film, “Birdboy: The Forgotten Children,” directed by Alberto Vázquez and Pedro Rivero, adapted from Vázquez’s comic, is an oft-grisly and always visually dazzling allegorical fantasy that puts funny animals in a post-dystopian semi-wasteland. The movie opens in darkness, with a child’s voice saying, “The future is the past, garbage is our present. Blood is our law!” The color palette of a world prior to an industrial accident that looks nuclear or worse is one of pink pastels and black silhouettes. Once disaster hits, the modes are Kafka meets Marquez meets Mickey Mouse and/or Maus, and many more. The central character is Dinky, a little mouse with a persistent robot alarm clock and religious fanatic parents. Her dad likes to teach her lesson while squeezing a ruby Baby Jesus squeak toy, which seems to ooze real blood. Dinky is eager to escape them, and so she sets out with two friends, a rabbit and a fox, to seek a new place to live with Birdboy, a former friend of Dinky’s whose story has acquired mythical dimensions in the time they’ve been apart. In addition to the horrible environment, the kids have to battle their own demons, which encourage them to push each other off cliffs and do other nasty things. A giant black spider chases them around an abandoned house. Eventually they wind up in a waste site, ruled by a rat king and his child cult—these are the ones for which blood is law. In the meantime, Birdboy himself is on a Personal Journey, remembering his lighthouse-keeper father before sinking into the see, to be overwhelmed by parasite-like creatures who look like smushed-up smiley emojis. As you might infer, none of this is really kid’s stuff. The good characters endure almost constant beatings, and the baddies are incredibly bloodthirsty and menacing. The variegated but never slick character design and animation is based on relatively simple drawing styles, and yet the characters are as vivid and sometimes scarier than the very technologically advanced nasties of, say, “Toy Story 3” (a film to which this actually does owe a bit of a debt). The movie is grisly and its sense of humor is mordant, but it winds up communicating a heartbreak that’s pretty straightforward, all things considered.